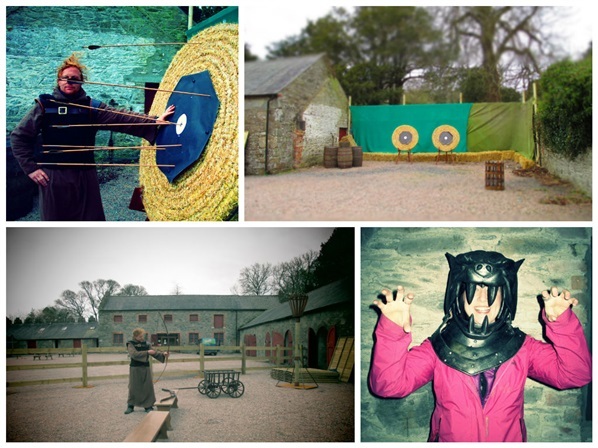 With the eagerly awaited Season 4 of Game of Thrones premiering this weekend, Clearsky Adventure Centre in Castle Ward, Co. Down is launching 3 new Game of Thrones experiences in the very location where the Bafta Award Winning TV series was filmed! If your life has been taken over by the boxset or you can’t wait to get your weekly fix of Westeros then be sure to head to Castle Ward and walk in the footsteps of Sean Bean, Peter Dinklage and Alfie Allen as you recreate scenes where Winterfell was first brought to life. I caught up with the guys at Clearsky Adventure Centre to go behind the scenes as they prepared for the opening of these unique experiences including their Bran and Ned Archery packages and a cycle tour of the onsite filming locations. On the drive up to Clearsky’s courtyard headquarters through Castle Ward it didn’t take me long to see why the 820 acre site was chosen by Hollywood for the smash hit series. Wide open fields sweeping down to the stunning Strangford Lough with ancient buildings and the remains of a medieval castle it doesn’t take much imagination to transport you to the fantasy world. On arrival I met up with Eddie, a Clearsky instructor who took me through how Winterfell will be resurrected over the coming weeks. Our first stop was Clearsky HQ a 16th century courtyard where the finishing touches where being put together for their Game of Thrones Archery Experience. Eddie walked me through the experience which takes place on the actual location where young Bran Stark was trained by Jon Snow under the watchful eye of his father – it doesn’t get much more authentic than that! The experience starts in the courtyard barn, where participants will get kitted out in their Stark Family Costumes (shipped all the way from America). The foreboding Hounds Helm will be watching you from the wall as you prepare to enter Winterfell for the first time. 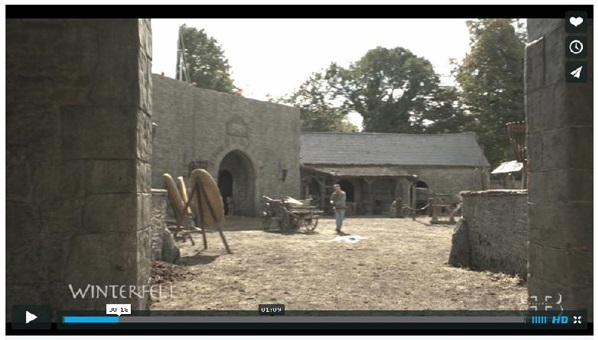 The courtyard area is used exclusively for the experience with a clever layout meaning once you enter the barn you will leave reality behind and exit into the world of Westeros. Decked out with recreated props from fire braziers to barrel kegs and of course the all important archery bosses the courtyard will allow you to experience the feeling of being on your very own movie set. It is here that you will receive instruction from ‘Jon Snow’ himself (aka character costumed archery instructor). You’ll then get the chance to shoot medieval arrows with ancient bows with loads of opportunities for photos so you can capture your favourite moments. Participants will get the chance to choose between the Bran Package or Ned Package – either way the experience is sure to be an authentic one. 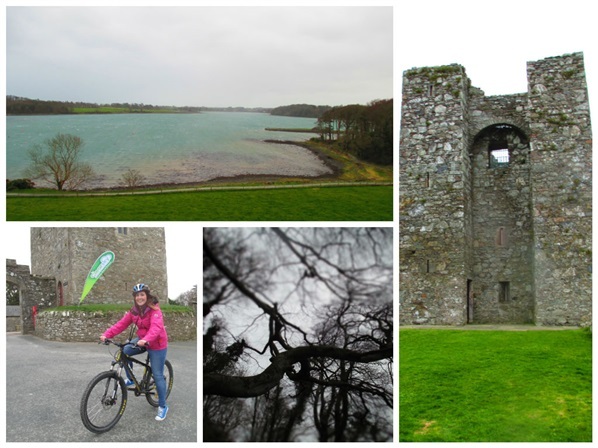 Clockwise: Strangford Lough the location for Robb's Camp, Audley's Castle, the hanging tree, me about to set off on the trails. Once we’d attempted to hit the bullseye a few times it was time to experience the filming location cycle tour and head out on the off road trails to visit the locations of many of the pivotal scenes filmed for the series. I was given my mountain bike and after some quick instruction headed out round the stunning grounds of the estate. As we biked our away along the off road trials Eddie let me in on a few secrets but I don’t want to give too much behind the scenes gossip away – you’ll just have to head down and ask the guys yourself! The Cycle Tour includes a Medieval Scroll map (which you can keep as a momento) including fun facts about each filming location and where to find them. You’ll also get to dress up in Stark Family costume capes and of course be given an all important sword – essential for recreating your own movie moments along the way. We passed many of the locations where the Game of Thrones pivotal scenes where filmed including 'Winterfell', ‘King Roberts Arrival’, ‘The Twins’, ‘Ned’s Picnic’, 'Baelor Battle Scene', 'Robb's Camp' and more. We also came across the spot of a gruesome hanging and Audley’s Castle where Walder Frey’s Raven once flew from. Click on the image below to see the locations come to life on screen. Once back from the cycle Eddie explained that they were eagerly awaiting the arrival of a 40 man teepee for their final experience; the King Robert Banquet. This will be an authentic medieval banquet complete with hog roast where participants will get exclusive use of the courtyard for a tasty lunch. A great way to complete the Game of Thrones experience. Game of Thrones Archery Experiences are also available as gift vouchers for couples and groups. A unique present for any Game of Thrones fans. For more information on the experiences including prices visit Clearsky Adventure Centre. 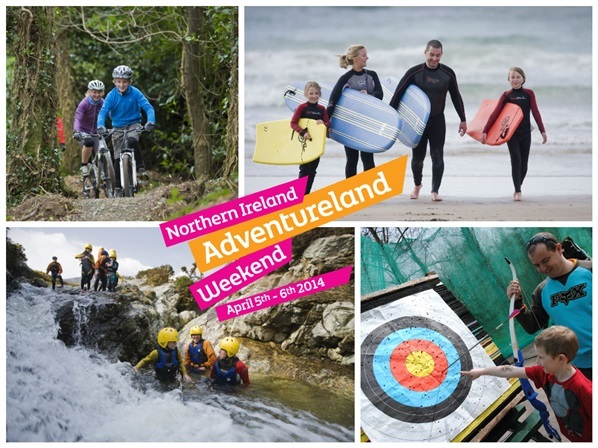 The range of activities happening during Northern Ireland Adventureland Weekend (Sat 5th & Sun 6th April) and indeed throughout the year in the capital are proof that adventure is most definitely not confined to the countryside! With countless restaurants and colourful nightlife the best part is the fun doesn’t have to stop once the outdoor action does. Have an exhilarating experience in the city at Northern Ireland’s only cable wakeboarding site with the Titanic building as your backdrop! Cable Wake Boarding is the newest and one of the fastest growing and most exciting watersports in which the wake boarder’s rope and handle are pulled by an electrically-driven cable, as opposed to a motorboat. No experience is necessary and an experienced wake boarder and instructor will be present with you for the entire session making this the perfect time to give it a go. Guaranteed to be the most exciting sightseeing tour you will ever experience a Segway Tour of the Titanic Quarter is not to be missed. These two wheeled machines will add an exciting element to the tour making this a truly unique and unforgettable experience. 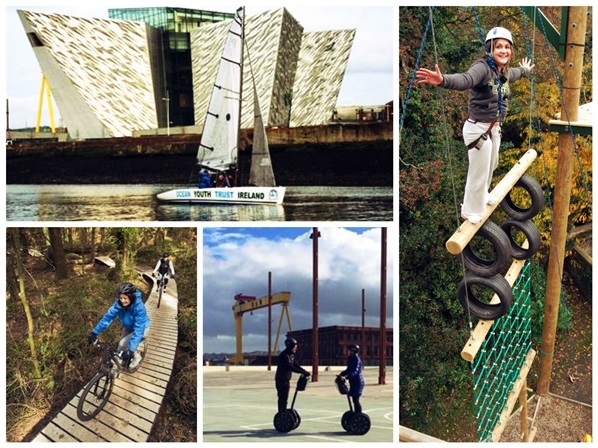 Guided by a Segway NI instructor you’ll visit all the key sites of the famous ship's history including the Titanic Dock and Pump House. Forget the stereotypical view of gin and tonic on a luxury yacht; sailing is a fantastic sport for everyone to enjoy especially over Northern Ireland Adventureland Weekend as Ocean Youth Trust Ireland is offering a chance to experience hands on sailing in the shadow of the Titanic building. You’ll learn to sail in their 2-3 person dinghies with a fully qualified sailing instructor who will show you the ropes ensuring you get the most out of your session. Don’t miss out on this unique opportunity to sail in the heart of the city. Experience caving in the largest realistic caving system in the world. With three large caverns, two rivers, a waterfall and over 200 meters of passageways, you’ll forget you’re anywhere near the capital as you get lost (figuratively of course!) in this mesmerizing cavern. This fun, safe and totally unique activity is sure to keep you captivated! Learn new skills while challenging yourself to reach new heights. You and your mates will have the opportunity to try climbing and abseiling with a fun added twist. Do you trust your friends enough to take on the blindfold challenge?! Do you have the nerves to take on the vertical assault course? Challenge yourself on the gravity defying obstacles and race your friends to reach the top. Your heart will be racing once you’ve hit the highest point where it will then be time to take a leap of faith on the fan descender involving jumping from a high platform all the way to back to earth. Explore the fantastic Banrett Demesne Trails with an experienced instructor. This introductory session to this adrenaline sport is sure to bring some excitement to your day. The instructor will teach you a couple of basic mountain biking skills before taking you on a circuit of these fresh new trails. Bike Hire and Helmet is included. Be warned: you are sure to get the Mountain Bike bug! There are loads more activities on offer for just £10 and 50% Off, visit the Northern Ireland Adventureland Website for a full list of events and to book online today. With so many great outdoor activities to try over Nothern Ireland Adventureland Weekend, it makes sense to build a short break around the fun! Make sure to check out Discover Northern Ireland for deals on great value short breaks and for even more fun things to do in Belfast. Hit the Beach during Northern Ireland Adventureland Weekend! Adventureland is back and there’s lots happening on the beach! Surfing is undoubtedly one of the most popular activities on the beaches of Northern Ireland. This year’s Northern Ireland Adventureland Weekend includes lots of fantastic offers to get you riding your first wave in no time, all at a reduced cost! The perfect activity for all ages from 6 years old meaning the whole family is sure to have a blast on the water! Put a wetsuit on and jump into the blue Atlantic Ocean; it’s time to learn how to surf the waves into the shore! The perfect opportunity to take in the culture of surfing along one of Ireland's longest beaches, this exhilarating and exciting experience is perfect for all families who love the beach and everything about it. During this adult only session you will learn all the skills and techniques needed to ride the waves at one of the most highly qualified ASI (Academy of Surf Instructors) schools in the country. Learn to surf with Northern Ireland’s only Quicksilver approved surf school with the highest qualified coaches in Northern Ireland. This is a 2 hour beginner session where all equipment is provided including wetsuits and surf boards so all you have to worry about is showing up and having fun! Join Alive Surf School for a brilliant day out and learn how to surf on one of the North Coast's most popular beaches. All equipment including surf boards and wetsuits will be provided. Once kitted out you will learn the basics before hitting the waves to put it into practice. All ages from 8 and up are welcome. You won’t have to travel far to participate in this popular Californian beach activity. A new activity to the beaches of Northern Ireland, a land paddle is a long board on skate wheels controlled by the rider’s feet, weight and distribution, similar to stand up paddleboarding (but on land). After a short briefing your instructor will guide you on the skills required to get the best from your experience introducing riding stance, stopping and breaking techniques, toe side turns, heel side turns and paddle techniques. Have fun with family and friends whilst learning one of the fastest growing sports in the world with Northern Ireland’s first ASI Accredited SUP Instructors. Get ready to take part in a fully structured 1 hour starter lesson at East Strand Beach or Portrush Harbour (depending on conditions). The lesson will include information on your paddle and board as well as all the paddling skills and techniques you need to know to learn stand up paddling in a few easy and fun steps. All bookings should be made through the OutdoorNI Adventureland Website where the full programme of events can be viewed. Places are filling up fast so we suggest booking early to avoid disappointment. The first ever MountainBikeNI.com video was officially realised last week showcasing each of Northern Ireland's new trail centres in Rostrevor, Castlewellan and Davagh Forest. Filmed and edited by local rider and reknowned videographer Andy Yoong (Honcho Media), this video highlights just how far mountain biking in Northern Ireland has come in the last year. We caught up with Andy during filming to get his thoughts on this shoot and Northern Ireland's rise to fame as a mountain biking destination over the last twelve months. MountainBikeNI.com: You’re a busy man these days, so what’s it like being back able to film some mountain biking on Northern Ireland’s new trails? 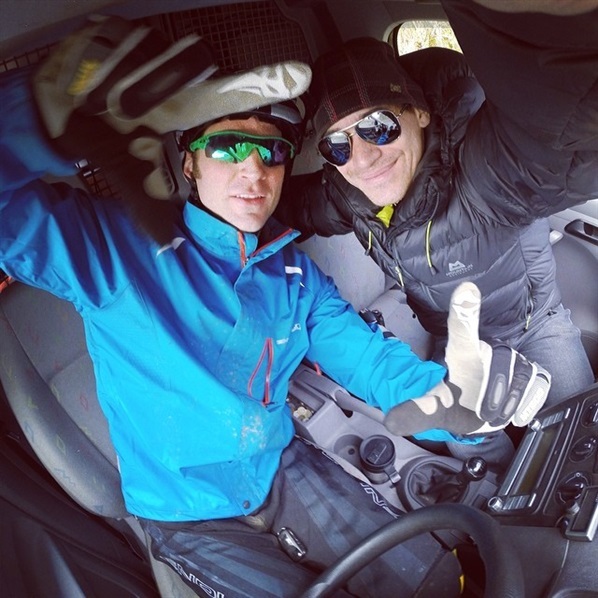 Andy: It’s a great opportunity to be able to produce these videos for MountainBikeNI. I’ve been riding bikes for years now and feel very fortunate to be able to combine my work with one of my passions. MountainBikeNI.com: You pulled in some of the country’s top mountain bikers for this video - in your opinion what is it about their riding style that works on film? Andy: I tried to select a number of riders who would show off the new trails in their best light. Colin Ross is the current Irish Downhill Champion and series champion. He’s one of the best downhill riders in the country at the moment and there was no better person to show off the technical nature of 'On the Pulse' in Rostrevor. The trails in Davagh Forest have a nice fun flow to them so Ewan Doherty and Jamie McCullough were an ideal choice. They’re two good friends who would hit the trails regularily together and have a really playful riding style, especially Jamie. Jamie has been on the scene for years and can really move a bike around. His style probably comes from his dirt jump background. Ewan is a bit of an underdog. He’s been racing downhill for years and has been part of the Irish team on numerous occasions. He’s definitely up there with the best in Ireland. Glyn O’Brien and James MacFerran were used in the Castlewellan section. Like myself, Glyn is one of the original crew of bikers who raced on the World Cup scene back in the day. I’ve travelled, raced and worked with him many times over the past 15-20 years and for an auld boy he can still shift a bike, so he was an easy choice. Jimmy Mac has been around for a while too. In the past year or two has really stepped it up a level in the Enduro scene so he has the fitness to be one of the best riders in Castlewellan. He has definitely got good bike handling skills being a former British minibike champion. MountainBikeNI.com: You’ve ridden and filmed all over the world, what do you make of Northern Ireland’s new trail developments and the direction we are headed as a mountain biking destination? Andy: The new trail developments have been a great addition to mountain biking in Northern Ireland. The sport has really boomed since their arrival, becoming nearly a mainstream sport. It was only a few years ago that the scene was quite small over here. Everyone knew everyone back then. Now I am seeing more and more riders on the trails every time I go out and many new faces. The trails centres also offer an accessible way into the sport for beginner riders aspiring to compete before moving on to more technical natural trails that they will most likely meet in competition. As a mountain biking desitination Northern Ireland has a lot to offer - it now has a large network of trails that almost anyone can ride. Combine that with the amazing locations such as beaches and mountains within a short distance of each other and we have a destination that has a lot to offer the outdoor type. MountainBikeNI.com: You’ve been patiently been waiting to shoot this video for years now, I take it you’re enjoying yourself! Andy: Yeah, for me it’s the perfect job. To be out working, shooting mountain bike videos with my friends and being outside in the mountains and forests, it doesn’t get much better. 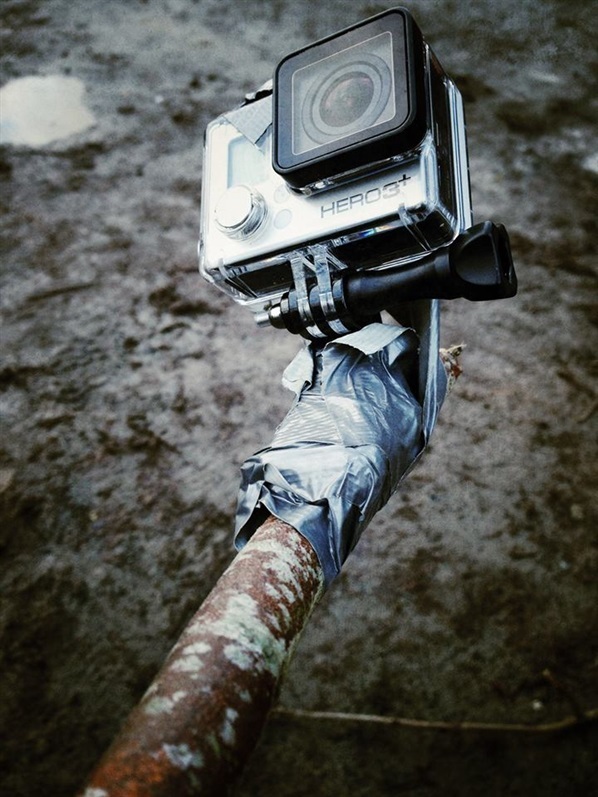 Just in case you were trying to work out how Andy captured those incredible head cam shots! You've reached the Northern Ireland Adventureland Blog for 2014 but don't worry this fantastic weekend of half price and discounted events is back for 2015. Check out our Northern Ireland Adventureland Weekend family blog for 2015 for a whole host of fantastic family events happening on Sat 28th & Sun 29th March 2015. The best part about Northern Ireland Adventureland Weekend is that it is hassle free – simply choose from one of the many activities on offer and book online. Then all that is left to do is enjoy a memorable day out with the family – make sure you don’t forget the camera! 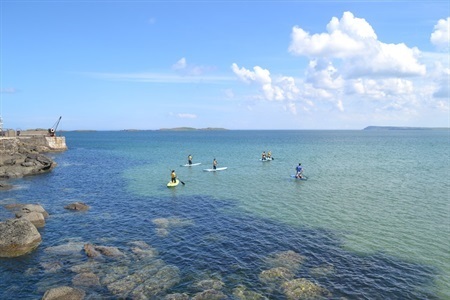 Relax and chill out while the kids hit the waves or join in on the fun with them and see who can stand up first and ride the waves into the shore on this 2 hour lesson from the winner of ‘Best Family Activity Provider’ at the OutdoorNI Awards 2013. Learn new skills while challenging yourself to reach new heights with the friendly staff at Belfast Activity Centre. You and the kids will have the opportunity to try climbing and abseiling with a fun added twist. See if you trust your family enough to take on the blindfold challenge! Compete in a 2 hour hi-tech laser combat session on a choice of purpose -built battlefields, complete with bunkers, trench systems and gun emplacements. See if the kids can beat mum and dad or if your siblings are really on your side as you do battle with full replica weapons, jackets and power packs recording individual and team scores. Try Mountain Biking with the family right in the middle of the stunning Lagan Valley Regional Park only minutes from Belfast City Centre. This event is geared towards kids and families and is a great way to introduce everyone to the marvelous world of mountain biking on the Barnett Demesne Trails in Belfast. Three exciting family activities over three hours; master the heights of the climbing wall, step into the shoes of Robin Hood on an archery session before finishing the session working together on a fun orienteering challenge to find the checkpoints and develop your navigation skills. Each ticket will be valid for you and up to 2 friends or family members meaning you will have exclusive use of the boat along with your very own instructor ensuring you will get plenty of hands on experience from the experts. There are so many great events happening over the weekend, in fact too many to mention! Make sure you check out the Northern Ireland Adventureland website for a full list of family friendly activities available to book.